The story is populated by anthropomorphic dogs, and the protagonist is Gaius James Rover, a dachshund who dreams of eventually starting his own circus. Hoping to earn money towards this project, he invests his life savings in a cargo delivery of rum - which goes horribly wrong, thanks to a corrupt governor and a band of mercenary pirates. 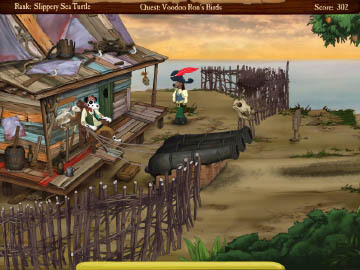 His only hope of financial salvation lies in joining the pirates and locating a long-lost treasure before they do. Art-wise, character designs are more cartoony than realistic, matching the comedic tone. In contrast, the background art is quite detailed. A concerted effort was made to hire the right voice actors, so the dialogue sounds good, and the overall story within the game develops nicely. You gradually get to know Gaius better (especially how he got along with his father), and boy will you hate the governor by the end! Great antagonist, even if he mostly works in the background. Puzzle-wise, I'm a seasoned point-and-click adventure gamer, so I only consulted a walkthrough once, and for one puzzle I systematically guessed my way through. If you've not played point-and-click adventure games before, your mileage may vary. There's a sort of internal logic to grasp. For example, you have a bottle of wine but no corkscrew to open it with, so you have to think, where else have you seen something sharp and pointy? Figuring out puzzles is all part of the fun. Any adventure game involving pirates usually owes something to one of the greatest pirate adventure games ever made, LucasArts' 1990 The Secret of Monkey Island. (If you've never played it, allow me to recommend the ScummVM engine.) Jolly Rover is no exception to its influence, and while many elements are obviously inspired by it, the game doesn't feel derivative; it maintains its own sense of originality. 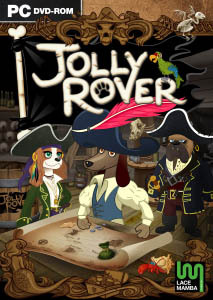 I think my main complaint with Jolly Rover would be that it's a little linear; however, it hides this by making each new puzzle follow as a logical consequence of the situation and the plot, so the story definitely drives the game. I also love seeing a game not take itself too seriously. Despite a PG rating, there were surprising moments of adult dialog, as well as adventure game meta-references: "Maybe ye be helpin' me with somethin'." "Only if it involves finding random objects and using them with other objects." Or, after simply being given an item you're looking for, instead of being asked to fetch something in exchange for it, "What? No magic quests?" "Ye be bitter fer a pup." There are also bonus items to discover - crackers, pieces of eight, and fragments of pirate flags. Finding them all results in some achievement medals at the end of the game, as well as peeks at development art, music and short character biographies. Not terribly rewarding, I must admit, but finding all the bonus items is a real challenge; I found all but one of each. So close! Arrgh. 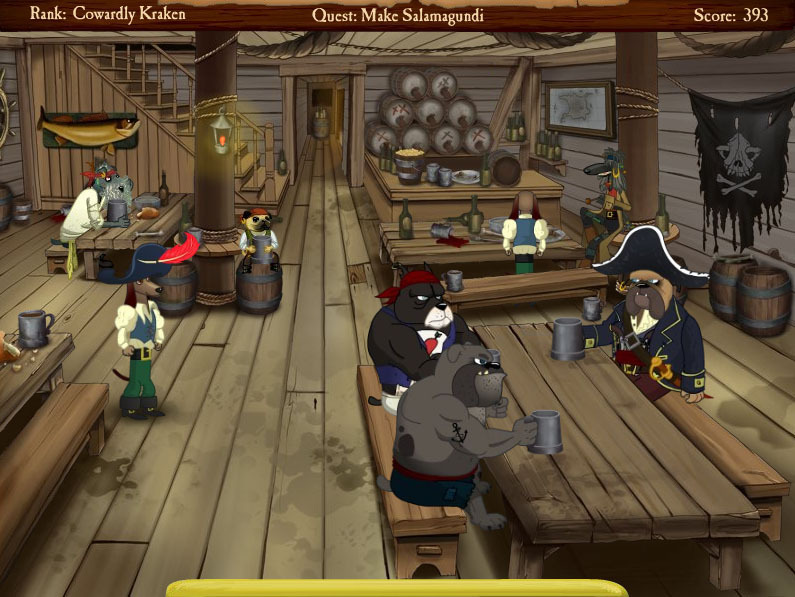 Regardless of whether you find them all, finishing the game activates the developer's optional audio commentary, should you want to play it again. Would I recommend this game? If you've never tried a 2D adventure game before, or want something casual to pass the time, then yes, this is at just the right level to enter the genre with. 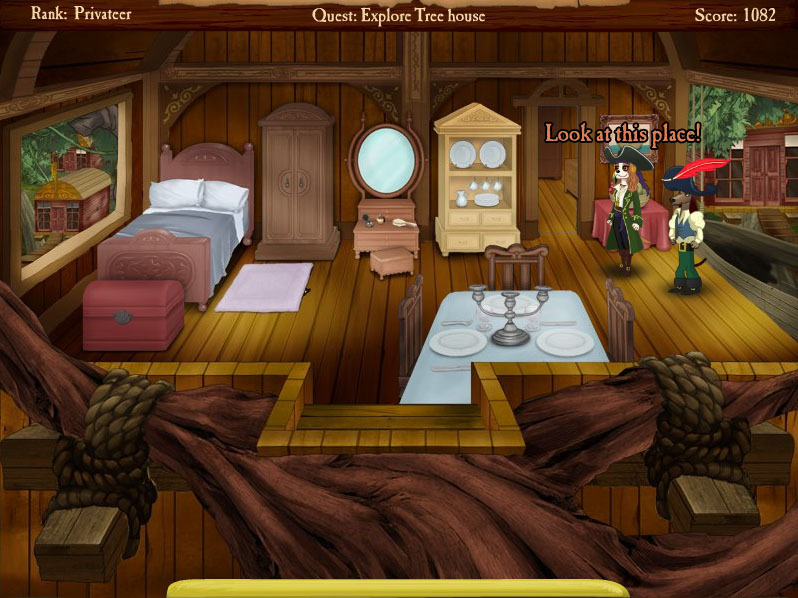 I will admit to being biased towards point-and-click adventures, however, and I certainly enjoyed it. Still not sure? Try the demo version! Unless it's changed since the last time I played it, you get to experience the first two-fifths of the game (a good chunk of it) - for free! What a nice surprise! I hope you enjoy it, and if you're interested when you're done, give the game a rating or a review at GamingFurEver! Whilst you're thanking dronon, I'll thank you for the heads-up about it being on special right now. £3 for two games? I think I'll have to check them out. Excellent - you're very welcome!